Since I have become a born again Christian, I have been inspired, at various times, by the Holy Spirit, to write some things that people tell me are thought provoking and sometimes inspirational. I am publishing these writings in this web ministry in the hope that they may bring someone closer to our Lord and Saviour Jesus Christ. and a section containing general information. Inspirational includes thoughts concerning my previous lifestyle, things I see going on in the world and some (poetry? ), I have written. The tool, that the Holy Spirit had to work with, namely me, limits the quality. All sections will be updated from time to time as the Spirit leads me on my Christian journey Home. Biblical studies and Beliefs, lists areas I have been guided to study and my resulting beliefs. While you may not agree with my beliefs and conclusions, I pray that you will be prompted to study the Bible. God speaks to His children through Holy Scripture. I do not pretend to be someone special. I am not a perfect being; I am a sinner, saved by Grace. At times, because I still have a worldly body, I fail and become hypocritical. But, I do strive to follow where the Holy Spirit leads me. 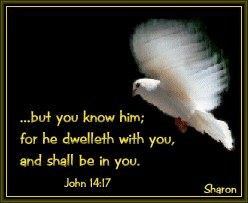 This inspiration of the Spirit is available to all Christians, if we will only be still and listen. Do you know Jesus? **** An invitation. **** Click here!! These two sites are completely Bible-based. They offer an extensive collection of informative articles, commentaries & Scriptural studies. Quick & painless & doesn't cost you anything but a mouse click!! Cybergrace Banner Exchange? Something you need to know first.